Sennheiser HD 700 is considered a jewel among the high-fidelity headphones. You won’t find any particularly future-proofed feature in this model. Instead, it is dedicated to a punchy and dynamic bass and a uniquely wide soundstage. As the dedicated audiophiles that we are, we had to test this model in real-time and see does it live up to its’ other HD siblings, from either open-back and closed-back group? We wrote this review to pick the main highlights of Sennheiser HD 700 and answer the key questions every audiophile asks when unsure about the model’s value. Take your cup of tea and read through the features, design, and performance of HD 700 to learn more! Unlike wireless Bluetooth headphones, Sennheiser HD 700 won’t astonish you with a bunch of technical terms and technologies. Its’ main features are mainly dedicated to what’s the most important – soundstage and area of use. Sennheiser HD 700 is an over-ear type of headphones. Meaning of this is that they naturally cover your entire ear shell. However, open-back design means that there is still an inevitable space which breathes the music out of headphones. Open-back design limits the sound isolation capabilities of the HD 700. Instead, the sound is clearer and more spacious. The drawback for some is that this limits the sound isolation, which is very important when working with sensitive audio or if you are a DJ. These two are the main types of over-ear headphones and one sacrifices another. All in all, it is something of a personal preference. 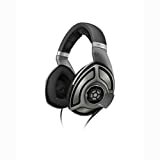 It is a commonplace that headphones which deliver more powerful bass and high-fidelity sound are openly exposed to harmonic distortion and air turbulence. Given that these models are in particular used for monitoring and music production studios, headphones need to be highly accurate and strive to eliminate all distortions that can harm the audio outcome. With this in mind, Sennheiser designed an advanced ventilated magnet system which circularly eliminates or at least tends to lower the air turbulence interfering with the drivers and causing harmonic distortion that emerges as a large problem. Sennheiser HD 700 was one of the first headphone models to introduce their unique 40mm drivers that produce the impeccable balance of sound and bass. Basically, they are equipped with high-end transducers. These transducers are transistors. Their purpose is to evenly enhance the impact of the soundstage and make it more balanced towards different genres of music. That’s what makes all Sennheiser headphones distinguished. They are eligible to customize for different music genres and styles. They are always a welcome guest in any DJ’s hands or monitoring, audio studios. Sennheiser HD 700 was first introduced in 2012 and by now, we have seen the significant oscillations and enhancements in Sennheiser’s flagship HD models. The modest selection of features for Sennheiser HD 700 is respective satisfaction, earning it 4 out of 5 stars. HD 700 is a high-end model. It is understandable that they require a top-end housing for their superb drivers. In terms of design and build, Sennheiser HD 700 is one of the best-equipped headphones you won’t be sorry opting for. Below, we are going to explain why. At the dimensions given by 8 x 5 x 10-inches, HD 700 weighs 14.4 ounces (275 grams). These numbers certainly sounded discouraging to you, so did they to us. Normally, these headphones are bulky without even touching them or looking at the number. They hold a large selection of top-notch components that need to be ensured secure. With this in mind, Sennheiser engineered the headphones with firmness in mind, so that they wouldn’t break and be inconsistent. Being an over-ear pair of headphones Sennheiser HD 700 is quite large. However, thanks to the velour covered ear pads, comfort should be the last thing concerning the user. Despite being not the lightest model available around, Sennheiser HD 700 is great for wearing for the extended time intervals. The headband is covered with silicon material so that the headphones lay naturally to the head and not pressurize it. So far, we didn’t experience any headaches while wearing these headphones. Instead, it took more than several hours for us to figure out that they are even on us. The cable of HD 700 is covered with a durable, black, fabric material in order to preserve the cable and prevent it from breaking too soon. Unfortunately, the cable has a 3.5mm only from one side. That one is meant to connect in a left or right headphone. Given that it’s detachable, it’s up to you. It is a Y-styled cable, with 9.8-foot length. It is necessarily sufficient for your movements or laying in the bed in order to listen to the music. Though, we would appreciate if it was slightly longer. The professionality of these headphones is, especially, put into the first plan with the 6.3 mm connector which strictly goes into the AV receivers. In case you own a headphone amplifier, you can plug your headphones there either. There will always be people who mind the fact headphones don’t connect via 3.5 mm plug. Keep in mind these are high-fidelity and hefty headphones and most likely a phone has no enough juice to power both. Another important feature to consider is that these headphones come with a padded case for extended durability. We didn’t have a problem fitting the case in our bags and carrying the headphones with us upon the need. The titan gray color is the only one you can choose. However, we like the attention to the detail in this design and appreciate stepping out from the regularity of the monotone black color. Headphones design is a well-deserved 5 out of 5. Sennheiser HD 700, like mentioned above, are equipped with 40mm drivers to establish a balanced and firm sound. There is not much to say about that. The headphones promise the uncompromised sound and are a combination of both high-fidelity and bass capabilities. In the further section, we will focus on the sound performance of HD 700 and in further paragraphs, you’ll see whether are they a true fit for you or not. Thanks to the rich soundstage, powerful and ground-shaking bass, one would think that these headphones are a portable, mini-version of some high-end home theater you would place in a living room. The circular design and powerful drivers make up for that, creating the impeccable surrounding sound. The bass is perfectly positioned to add additional texture to the music and create the cinema-like experience when you are watching a movie with them. The whole soundstage is rich and vivid. The midrange is prominent while the treble is what truly makes these headphones amazing. The open-back design did its’ job in making the sound irresistible. The headphones are enough unique and prone to customization that you can even enjoy even the most distinguished genres such as classical genre and even metal. You will feel the presence of every instrument and the clarity of the vocals. It won’t be too long until you forget that the headphones are even on your ears. All in all, it is the sound performance that is specific only to Sennheiser models. As expected, Sennheiser missed on adding a microphone to this model. It is mainly to avoid the interference between the open-back design. Even if the microphone had the noise-canceling technology, it would still pick the noise from headphones. Besides, these headphones, if not for professional use are used specifically for home use. Sennheiser is a company that cares about offering everything: comfort, value, great performance, and durability. Unfortunately, while Sennheiser HD 700 offers everything else, the pricing is way too unreasonable. Even now, after 5 years from releasing, HD 700 is a barely under $500 headphone. For that price, we would be hoping for a aircraft aluminum or stainless steel build. Overall, something to make sure the housing is firm. That being said, Sennheiser performs fair in this section, with 3 out of 5 rating. Sennheiser HD 700 is truly irresistible. It’s’ competition has to work a lot to reach this superb level of perfection. If it is suiting to your pocket, they will serve you greatly whether are you a hobby audiophile or a true music professional. Sennheiser HD 700 belongs to a balanced type of over-ear, open-back designed headphone to either high-fidelity soundstage and a rich and balanced bass. While you won’t see any spectacular features on this model, it offers a plastic, yet greatly durable build which firmly preserves the drivers and contributes to the stylish aesthetics. Headphones perform wonderfully, from the discreet, yet punchy bass to the detailed midrange and treble. Unfortunately, it is quite an expensive model, which is its’ main weakness.